Creamy, dreamy, and couldn’t be easier. 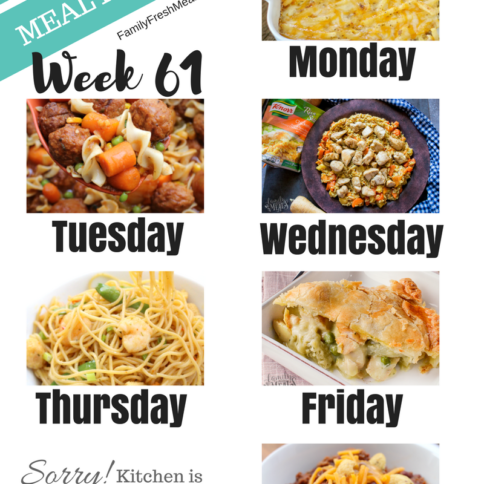 Some people have this crazy idea that a really good meal has to be complicated. You know, lots of different ingredients that you have to cook up in separate pans and somehow time everything out so that it all ends up on the table at once. Know what I say to that? Hogwash. Sometimes, the best meals are the simplest ones. 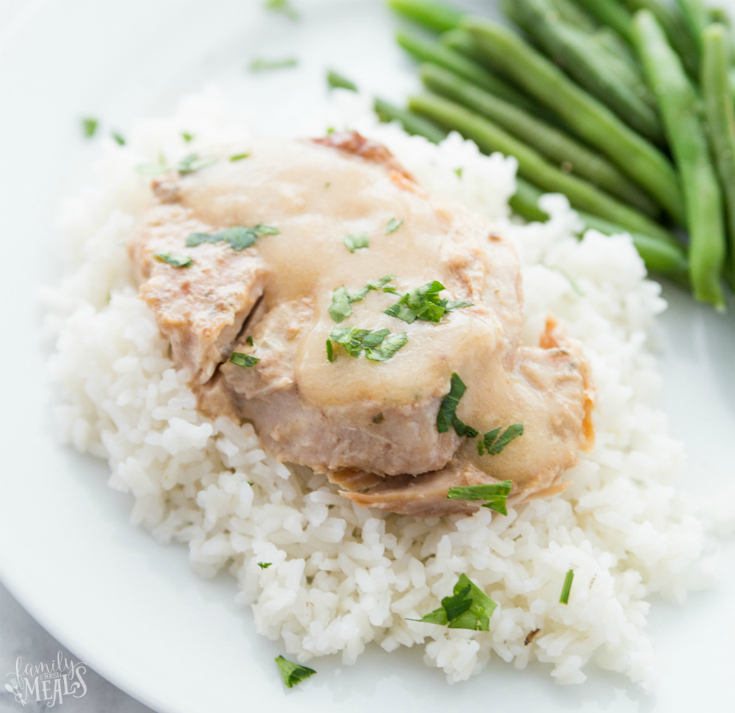 Take these Creamy Crockpot Pork Chops, for instance. 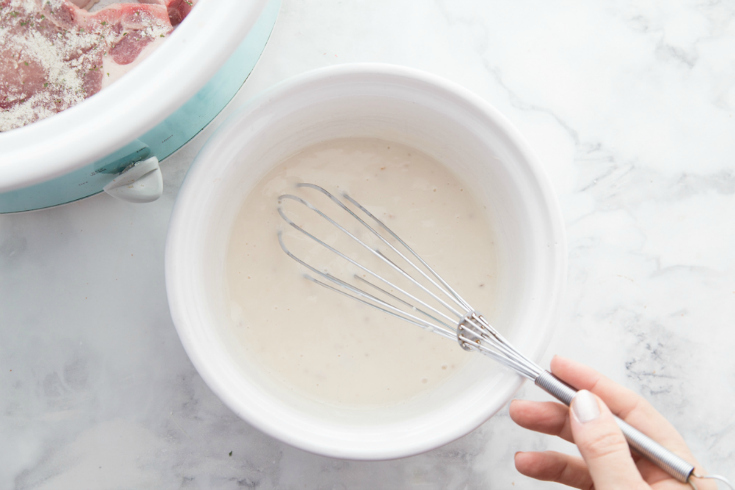 They have exactly five ingredients: porch chops, ranch seasoning, cream of mushroom soup, milk, and just a touch of cornstarch to thicken it. They require exactly one pot: your slow cooker’s crock. And making them takes just two steps: first cook everything together in the crock, then take out the chops and thicken the sauce before serving it. But when you dish out these tender chops, zesty with ranch seasoning, and ladle that creamy gravy over top of them, I guarantee you, absolutely no one as your table is going to look down their nose and ask you how much work you really did to make them. The only thing they’ll be asking for is more. 1. Spray 4-5 quart crockpot with no stick cooking spray. Sprinkle both sides of your pork chops with ranch dressing mix. 2. Place pork chops in your crockpot. In small bowl, combine cream of mushroom and milk and mix until smooth. 3. Pour soup mixture over pork chops. Cover and cook on LOW heat setting 5 to 6 hours , or HIGH for 3- 4 hours or until fork-tender and cook through. 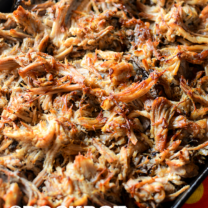 Remove pork chops from crockpot. 4. In small bowl, stir cornstarch and 2 tablespoons of warm water. Stir into mushroom sauce in crockpot. Cook on HIGH heat setting 3 to 5 minutes or until thickened. Serve sauce over pork chops. Take these Creamy Crockpot Pork Chops, for instance. 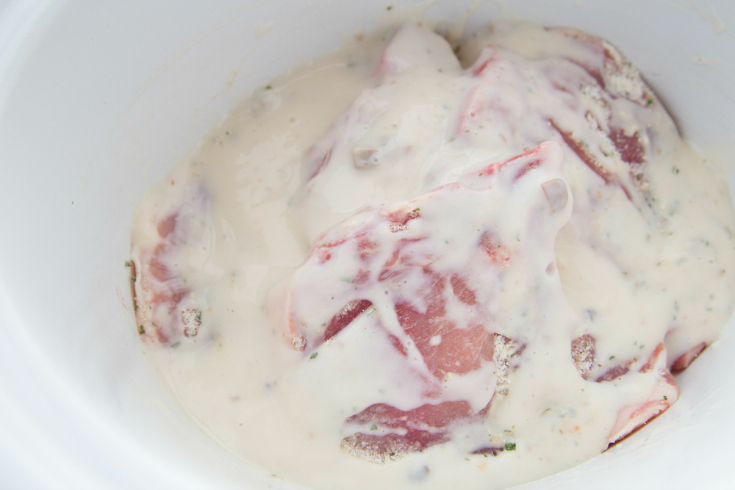 They have exactly five ingredients: porch chops, ranch seasoning and some cream of mushroom soup. Spray 4-5 quart crockpot with no stick cooking spray. 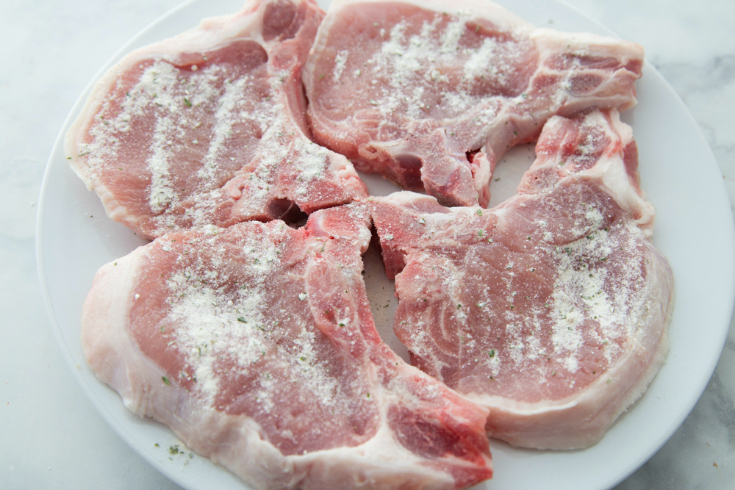 Sprinkle both sides of your pork chops with ranch dressing mix. Place pork chops in your crockpot. In small bowl, combine cream of mushroom and milk and mix until smooth. Pour soup over pork chops. Cover and cook on LOW heat setting 5 to 6 hours or until fork-tender. 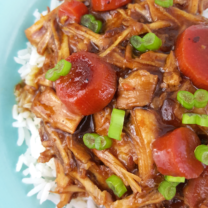 Remove pork chops from crockpot. In small bowl, stir cornstarch and 2 tablespoons of warm water. Stir into mushroom sauce in crockpot. Cook on HIGH heat setting 3 to 5 minutes or until thickened. 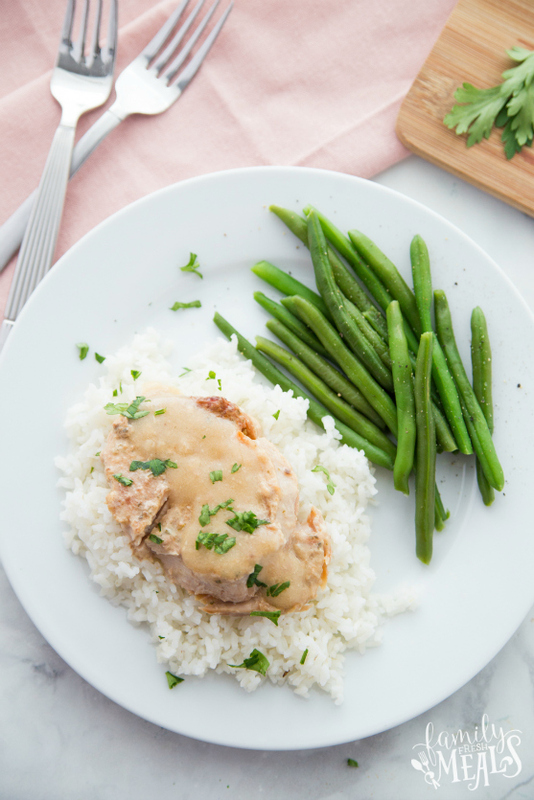 Serve sauce over pork chops. I cooked these last night and they were delicious! Second night I pulled apart meat and served over mashed potatoes. So good. My only problem was I only used two pork chops (thick) but made full sauce. A little too spicy. I never know what to do with half a can of mushroom soup. Am going to make it again but will make full recipe and freeze half. I am also going to try golden mushroom soup. 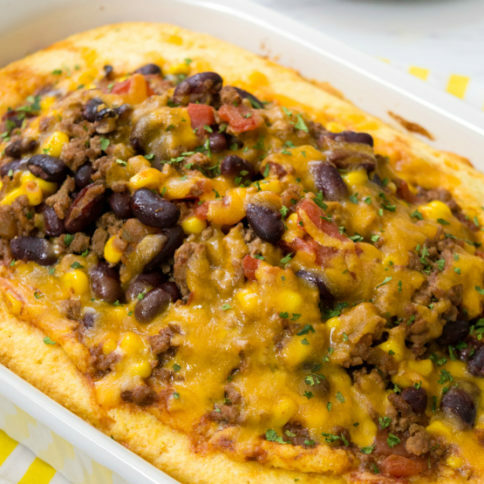 Where can I find the calorie count in your recipes? Thank you! 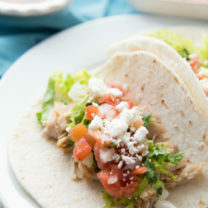 Has anyone tried making this in the instant pot rather than the crock pot?